Conference venue: Hotel Dubrovnik d.d. Hotel Dubrovnik is located in the main Zagreb square – Ban Jelačić Square. Hotel Dubrovnik is located in the very center of Zagreb and is easily accessible from different parts of the city. The Hotel is approximately 0.5 km from Zagreb Central Station, 1 km from the main bus station, 5.5 km from Zagreb Fair and 18 km from Zagreb Airport. Zagreb is very well connected by public transport – trams and buses. Ticket prices in one direction range from 4 to 15 kn, while a daily ticket costs 30 kn, and it is also possible to buy tickets for multiple days. 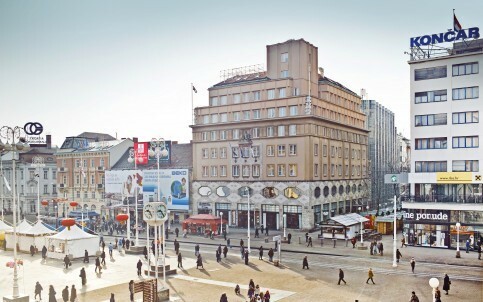 The tram station at Ban Jelačić Square is only a couple of minutes walk from the Hotel. There are a few taxi companies in Zagreb with very reasonable prices. Uber is also available. The easiest way to get from Zagreb Airport to the Hotel is by taxi, which you can order when making a hotel reservation. The price is 170 kn which is significantly cheaper then if you take a cab outside the airport. You can take a Croatia Airlines bus as well, which leaves after each flight, and brings passengers to the main bus station (approximately half an hour, 30 kn). From there you can take tram Nr. 6 in the direction of Črnomerec. The ride to Ban Jelačić Square is approximately ten minutes. You can find more information on the website of Zagreb Airport. Getting to the Hotel from the main bus station is easiest by tram Nr. 6 in the direction of Črnomerec. The ride to Ban Jelačić Square is approximately ten minutes. You can find the schedule of arrivals and departures of domestic and international buses on the website of the Main bus station. You can get from Zagreb Central Station to Hotel Dubrovnik easily with tram Nr. 6, in the direction of Črnomerec, or tram Nr. 13, direction Žitnjak. Hotel Dubrovnik is just two stops away from Zagreb Central Station. Croatian Railway website provides more information about schedules for domestic and international travel. If you are travelling by car, Hotel Dubrovnik has 24-hour guarded parking in Praška Street, approximately 100 m from the Hotel. The price of a parking space is 100,00 kn on a working day and 80,00 kn during the weekend. You need to make a reservation in advance. Highway A4 – Slavonska Avenue – follow signs for Zagreb Center.